Many years ago I had a small collection of Disney animated films on VHS lined up next to each other on a shelf under the TV. Every day I would insert one into the VCR and start watching like it was my first time. Although I didn’t know English yet, I watched them over and over again, appreciating the magic that Disney fit inside a VHS cassette. Today, I can still remember my favorite and least favorite Disney movies, judged by their visual aesthetics, with “The Little Mermaid” at the top and “Cinderella” at the bottom. Although I used to sing “Bibbidi-Bobbidi-Boo” all day long, “Cinderella” always looked too colorless and cold to me. Many years later, when Disney announced its plans to remake this classic animation, I was not a bit interested in watching it. However, following one of the best publicity campaigns I have ever seen, and the inclusion of much anticipated short animated feature “Frozen Fever” before the movie, I decided to give it a shot. Lily James plays the traumatized Ella, who lost her mother as a child and made a promise to always have courage and be kind. Years after her mother’s death, Ella’s father marries widow Lady Tremaine (Cate Blanchett). Ella gives her blessing to her father, and Lady Tremaine moves in along with Lucifer (her cat), and her two daughters: Anastasia (Holliday Grainger) and Drisella (Sophie McShera). After her father’s sudden death, Ella’s life is turned upside down. Lady Tremaine, once again widowed, starts treating Ella as a servant after she dismisses all the other workers in the house to save money. Anastasia and Drissella—whose never-ending bickering is annoying at best—name Ella “Cinderella” when seeing her face covered by cinders after sleeping next to the fireplace. Meanwhile, in another part of the kingdom, a bachelor prince named Kit (Richard Madden) struggles with his responsibilities as the heir of the throne, a position that appears especially weighty in light of his father’s intensifying illness. Ella and Kit cross paths and love happens. In order to avoid marrying a pre-determined princess for the sake of the kingdom, a ball is planned with every eligible maiden in the kingdom invited. It’s now Ella’s chance to impress the white privileged prince and to get her happy ending and marry him. 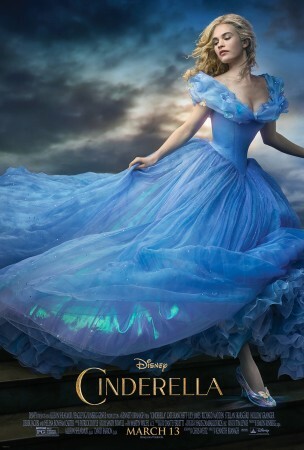 Although the story is slightly more faithful to the original tale, the little additions don’t add enough material to make “Cinderella” worth the time. The cast, on the other hand, are the true gems of this film. Cate Blanchett is a very compelling Lady Tremaine, whose bold character is greatly vulnerable to false depictions and weak portrayals. Her character is tragic, devastating and even worth sympathy, and we get to see reason behind her ruthless behavior and actions towards Ella. The Fairy Godmother, (Helena Bonham Carter) on the other hand, needed more development instead of over-the-top costumes and CGI effects. It’s hard to respectfully portray the lovely Fairy Godmother in the original animation, but Carter’s casting in the role feels rather more gimmicky than reasonable. As for Lucifer and the mice, I believe it was a good choice not to let the mice speak in human language, yet Disney managed to keep the memory of those scenes by recreating their unique sounds and having Ella talking to them, believing than animals understand humans. One of the elements standing out among others is the costumes and their borderline appearance between reality and cartoon. It was also my highest appreciation that Disney used almost the entire color palette in order to make “Cinderella” colorful and pleasing to the eye. If you’re still a fan of the original animated feature, you should not feel threatened by this live-action remake. “Cinderella” is not a celebration of its history throughout the generations, but a retelling of a story that was built to be financially successful. Like the Fairy Godmother’s magic, it won’t last long but it will amuse you as long as it can. If anything is certain, Disney is back in the game and if “Frozen” doesn’t make use of all its resources, we can expect to see more interesting live-action remakes to come.